On November 14 and 15, 2008, numerous grassroots and citizen groups mobilized a thousands of people to protest the coal industry and its financiers. The groups organizing the actions included Rainforest Action Network, Greenpeace, Rising Tide, Mountain Justice, Student Environmental Action Coalition (SEAC), Coal River Mountain Watch, Ohio Valley Environmental Coalition, Black Mesa Water Coalition, Southern Energy Network, Heartwood, Chesapeake Climate Action Network, Coop America, Earthfirst, and Mountain Justice. Earth First and Rising Tide activists placed banners at key commuter spots, protesting coal as a dirty fuel and Bank of America's role as major financier of the coal industry. In Raleigh and Wilmington, activists shut down dozens of Bank of America ATM machines with global warming crime scene tape. At the Bank of America headquarters in Charlotte, a banner supsended from helium balloons was left inside building with the message, "Stop Banking on Climate Change." Activists from Rainforest Action Network and Everglades Earth First crashed Bank of America's Energy Conference at the Ritz-Carleton on Key Biscayne. The group used a megaphone to present the need for Bank of America to move its financing away from coal and towards cleaner energy, and held up a banner that read, "Captains of Industry: Rise Above Dirty Energy!" Two activists were detained at the hotel when they returned to place flyers around the property. Energy Justice Network and other local activists took to the streets to protest Bank of America's financial support of construction of new coal plants and coal mining. Activists spent the day on Saturday collecting petition signatures, calling the Bank of America headquarters (704-386-5666) with complaints about their loans to Big Coal, and distributing information on how to purchase wind energy and on Bank of America's ties to big coal companies- including those that practice mountaintop removal mining. Members of Rising Tide Boston set up outside Bank of America and Citibank branches to highlight the primary role these banks play in financing in coal power and mining. The activists handed out samples of "green coal" to imitate the coal industry's marketing pitch of "Clean Coal." According to one activist's pitch, "Although we’ve spent a lot of time and resources researching ways to make coal environmentally friendly, or ‘clean and green’, the best way we found to do it is to paint it green." Activists from Rainforest Action Network met in midtown Manhattan in front of Citibank headquarters. the activists dressed in business attire to represent Citi bankers apologizing for the bank's role in financing coal and contributing to the climate crisis. The group engaged passersby, distributing an open letter outlining the commitments Citi should be making to a cleaner and more sustainable future, and also dispayed signs reading, "Sorry About Climate Change - Our Bad," "Sorry about those foreclosures," and "We promise - no more dirty investments." Rainforest Action Network and Greenpeace activists shut down dozens of Bank of America and Citi ATMs. Banners reading "Coal is Over" and "Don't forclose on the climate" were posted around the financial district. More than 30 activists occupied Bank of America and Citi branches, ending with a protest outside utility company PG&E. Activists used caution tape to shut down about 40 Citi and Bank of America ATMs. Activists posted a banner that read, "No Clean Coal! Save our Money Mountains Air and Future! Invest in Renewable Energy!" and shut down Bank of America and Citi ATMs. On November 11, 2007, Rainforest Action Network sponsored a nationwide set of actions aimed at CitiBank and Bank of America. Organizers reported actions in over 40 cities and towns as well as over 100 actions against Citi and Bank of America (with a couple of actions against Duke and Peabody). The following reports were compiled by RAN organizer Scott Parkin. Two college students, dressed as polar bears, locked themselves to the doors at Duke Energy to protest the construction of North Carolina’s Cliffside coal plants. At Kayford Mountain WV, Larry Gibson and students from James Madison University, assembled for the picture at the right to protest mountaintop removal. Folks from Coal River Mountain Watch in Whitesville -- right down the road from Marsh Fork Elementary -- also protested Bank of America financing mountaintop removal. Three activists from two local environmental groups — Earth First! and Rising Tide — unleashed a balloon-propelled banner earlier today attacking the bank for funding new coal plants and investing in mining companies that use environmentally destructive practices to extract coal. RAN Houston occupied and distributed flyers inside a Bank of America branch before being escorted out by police. RAN Austin passed out leaflets and petitioned a Bank of America branch in downtown Austin. 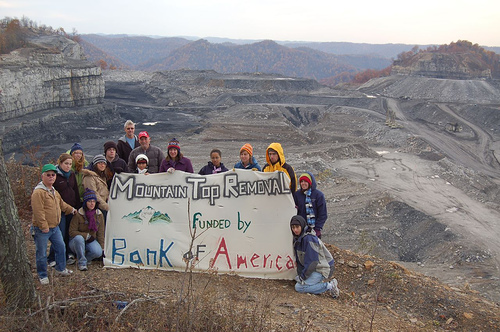 “Concerned youth from Charleston, WV gathered in the bleachers of a local high school under the shadow of a coal fired power plant to protest Citi and other funders of coal, such as Bank of America. These funders invest huge amounts of money in mountaintop removal and coal-fired power plants. Over 100 protests against coal funders are expected nation-wide, planned by groups such as the Rainforest Action Network, the Student Environmental Action Coalition, Coal River Mountain Watch. Check out the Las Vegas RYSE video here. A determined affinity group of activists shut down dozens of ATMs in Davis. Note the pic of people waiting in line for all the ATMs except Bank of America. Across downtown San Francisco, nearly every Bank of America and Citi ATM was shut down this morning as swarms of activists covered over 70 ATM’s with “Global Warming Crime Scene” tape and “closed” signs denouncing investments in coal that are killing our climate. Many customers enthusiastically took flyers, shocked to learn that their banks are using their money to invest in environmental destruction. A few hours later, a roving band of people in Haz-Mat suits featuring the Citi logo with smokestacks billowing climate-destroying gasses took to San Francisco streets. 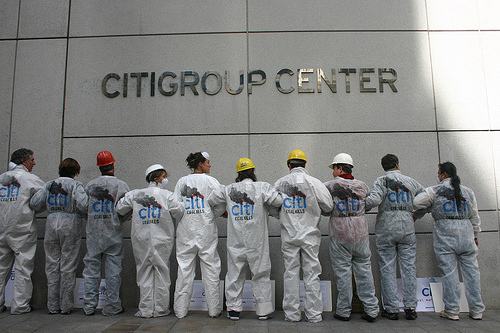 At 4 different Citi locations, people entered the branches educating customers about Citi’s dirty investments in the coal industry. “Die-Ins” were held inside branches and “global warming crime scenes” were announced as banks shuttered their doors. University of California, Santa Barbara: “When I arrived at 10am to set up, two men in suits were already present, and speaking with the local police force. Turns out, those guys were from Bank of America headquarters in LA, and came all the way up from LA to keep an eye on us! They observed our actions from afar throughout the day. Once we packed up, I approached one of them, introduced myself, thanked him for letting us demonstrate in front of the ATMs (even though we weren’t violating any laws) and asked if he’d like to sign the petition. Obviously, he declined. But he did say that he supported what we were doing. I’m assuming he won’t want to be quoted on that. We flyered and asked for signatures from 10-2, after which the campus was completely dead. We got about 75 signatures, and lots of press.” Read more about it here. Activists and polar bears demonstrated in front of Bank of America with the polar bears attempting to close their B of A accounts. Pictures here. Coal War on Bank of America video. About a dozen UC Berkeley students flyered and protested in front of the Bank of America in downtown Berkeley. The Oakland RYSE chapter flyered and performed a dance piece in front of the Citi branch at 14th and Broadway in downtown Oakland. UCLA RAN joined in the day of action inside and outside their local Bank of America branch. ”On Friday, November 16th, approximately 25 activists paid a visit to the Bank of America branch in downtown Olympia to demand an end to B of A’s coal investments. This boisterous group of college students and working people carried signs and banners and received plenty of support from passing motorists, who honked their horns or gave the thumbs-up sign. About thirty minutes into the protest, we tried to bring in some balloons for a banner float, but their security would not lets us in. After some talking, he decided to let those of us with accounts enter the bank to close our accounts. A few others were able to get in, talk to people and hold signs. About seven of us closed our accounts. Some of the tellers were curious as to why we would do this, and we informed them that Bank of America funds the coal industry, who are responsible for destroying mountains in Appalachia, and who accelerate climate chaos by spewing millions of tons of carbon dioxide into the atmosphere. These tellers appeared clueless about what their employer does. While talking to one of the higher-ups who assisted me with closing my account, I asked him if he was aware of Bank of America’s immoral actions, and he replied that that was none of his concern. After closing our accounts we walked back outside where our comrades were waiting, and were greeted with jubilation. We had cut all ties with this corporation that invests billions of dollars in coal power production, and it felt marvelous! We continued to hand fliers to pedestrians and inform B of A customers of their banks investment record. We ended the action by taking pictures of us all in front of the bank. “This banner about Citi was facing Interstate 75 just south of Cincinnati. Joe Barnett says “we live in fear” because his house is beneath a valley fill, so this is my response to the companies that help destroy Appalachian communities. ↑ "North Carolinians act against coal," The Understory, November 17, 2008. ↑ 2.0 2.1 2.2 2.3 [http://understory.ran.org/2008/11/14/anti-coal-movement-on-the-rise-national-day-of-action-in-over-50-cities/ "Anti-Coal Movement on the Rise; National Day of Action in Over 50 Cities," The Understory, November 14, 2008. ↑ "Rising Tide Boston helps big banks market 'Green Coal'," The Understory, November 17, 2008. ↑ "It's time for change - the buck stops here!," The Understory, November 15, 2008. This page was last edited on 20 November 2008, at 22:24.